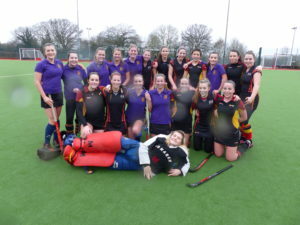 Despite cold, heavy rain on the first Sunday of term, some 30 Sternians turned out to contest the annual hockey tournament against the 1st XIs. On what was definitely a head back under the duvet day, the stoicism and competitive spirit of our Sternians and pupils shone through. With some former hockey captains in the Sternian Ladies team, they were a strong side but LWC fought back hard and the 3-1 win to the Sternians was not as easy as the score would suggest. The men played three shortened games to accommodate all the players which was fast paced and great fun with several knees bearing the scars of some tough tackles. The overall total of goals scored ensured that the Sternians won and our thanks to all the teams, supporters and parents for being such good sports.